sonapse | Our idea for networked solutions using the human brain! What can we do to make people’s real needs visible? At sonapse, it’s all about empowering people in the age of globalization and digitization. To do this, we want to use sonapse to give the (everyday)problem a platform and then solve it using the model of the human brain through clever networking. The idea is to create an online platform for visualizing people’s needs and finding solutions. The concept of crowdfunding sites is reversed and related to problems. The users do not submit completed projects for financing on the online platform, but describe problems and wishes that they would like to have solved: As described on crowdfunding pages projects, problems are described here (problemfunding). People who also would an introduced problem to be solved can invest in a possible problem solution. They invest in problem-solving and then choose problem solvers in their problem community by votings (Invoters): invite (friends for problem-solving) – invote – invent (customized solution). The Invoters get the problem-solution (product / service) first and cheaper, at the level where they invested in the problem. Specifically, the Invoters get a self-determined, tailor-made problem solution. The problem relevance of a set problem is determined by the community by means of invests in the possible problem solution. The sum in the solution pool reflects the urgency and importance of a problem in time (problem prices based on stock prices). Possible problem solvers will find relevant problems through the web platform. This means that there is the possibility of bringing together relevant problems, a potential customer base and start-up capital (in the form of pre-orders) with appropriate problem solvers. The potential problem solver introduces himself and his solution concept in the internal area of ​​the platform to the respective problem community. The problem community can then vote on the concept in the closed area of ​​the web platform. Says a concept to the Invoters, a deal is made. There can be several coordination rounds: Close exchange of problem community and solver so that the customer is not “bypassed”. Only when a deal has been made does the money flow from the problem community to the problem solver, and certain milestone payments can be negotiated. If no deal is made, no money flows. sonapse brings problem and solution together as easy as possible, helps with problem setting, exchange, payment processing. If the deal is successful, sonapse will receive 5% commission of the deal sum. Giving people the opportunity to make their real needs visible and to be able to solve them independently – to give the problem (desire) a platform and solve it like the human brain through clever networking. sonapse = solution + synapse : Solution through networking. A possible solver, such as door2door, sees the need here and offers itself as a problem solver. 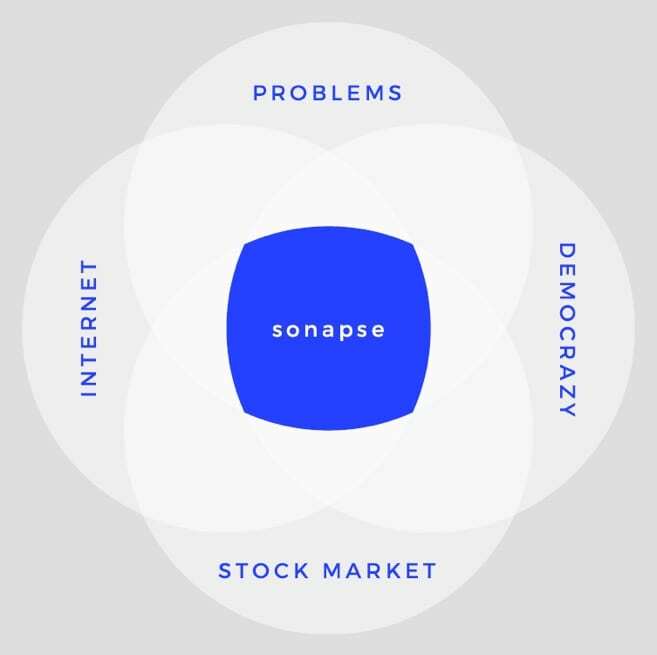 sonapse has the solution for you! Which example are you thinking of? Tell us your ideas and suggestions.